Diet in the Wild: The Northern Harrier is an omnivorous. They eat insects, small reptiles, amphibians, rodents, and other small birds. Conservation Status: These birds are not protected, but their population is diminishing due to the loss of grasslands to agriculture, industrial development, and urban sprawl. 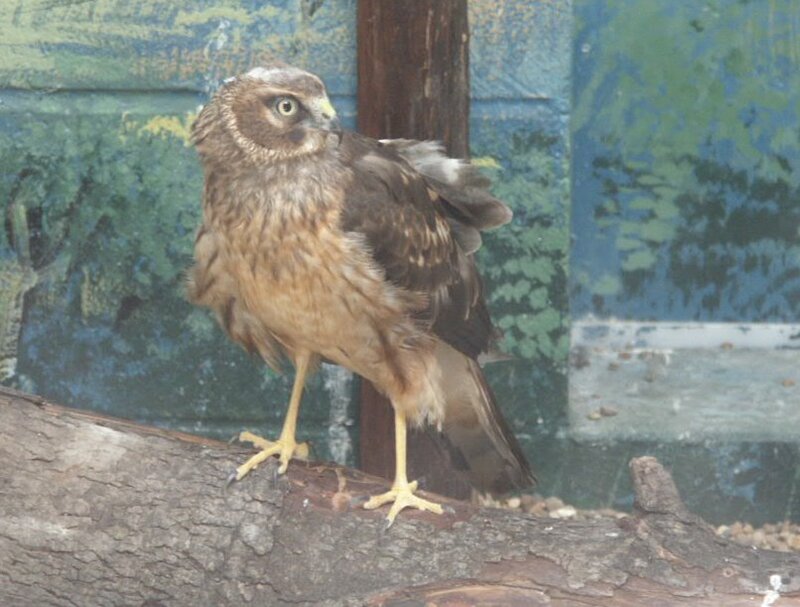 The Northern Harriers are considered an endangered species in Illinois. The Northern Harrier is a slender bird with long wings, a long tail, yellow legs, an owl-like facial disk, a conspicuous white rump (that shows easily in flight), and yellow eyes. Its wing span is 44 inches wide and the bird is between 17-24 inches in length. The male Northern Harriers are polygamous, but during the mating seasons the male helps each female separately in her nest. The females built their nests on the ground using dry sticks, straws, weed stems, and grass. The nests are built by shrubby ground or near swamp. The male gathers the material for the nest, dropping material from above to the female. The harrier would make a loud scream, kee-kee-kee: kek, kek, kek, when someone disturbs her or is near her territory. The harrier's owl-like facial appearance is due to the presence of "filo feathers" that facilitate acute directional hearing. This is useful for crepuscular (twilight) hunting as well as diurnal (daylight) hunting. It can also be useful for locating prey in areas of higher vegetation (grasses and marshes) where vision is somewhat limited. 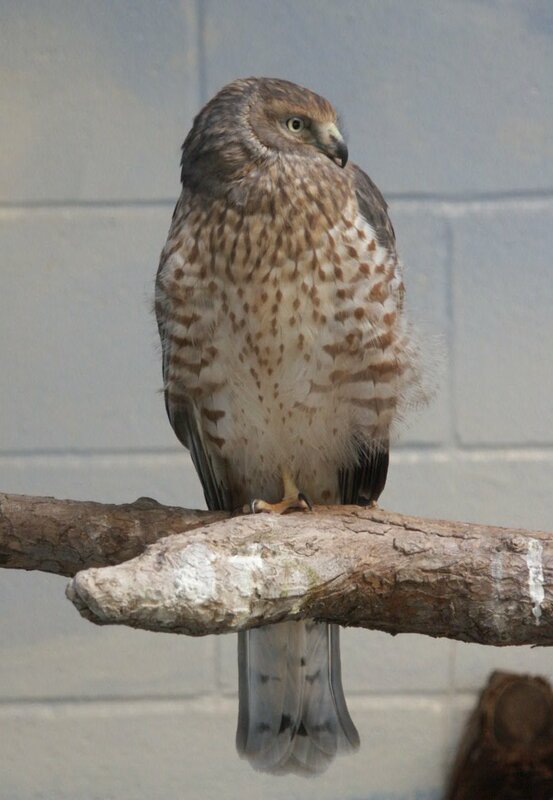 The northern harrier has a flight of speed of 24- 38 mph, which includes flapping and gliding. It usually flies low over the ground, about 10-30ft. up. The northern harrier flies in a pattern of a few wing beats followed by a short glide, wings held slightly up in a V shape, then drops quickly to its prey. There is presently one male juvenile at the zoo at the age of one year old. Even in a close area the juvenile acts like other hawks in the wild. The juvenile has his head down as though he is hunting for food. 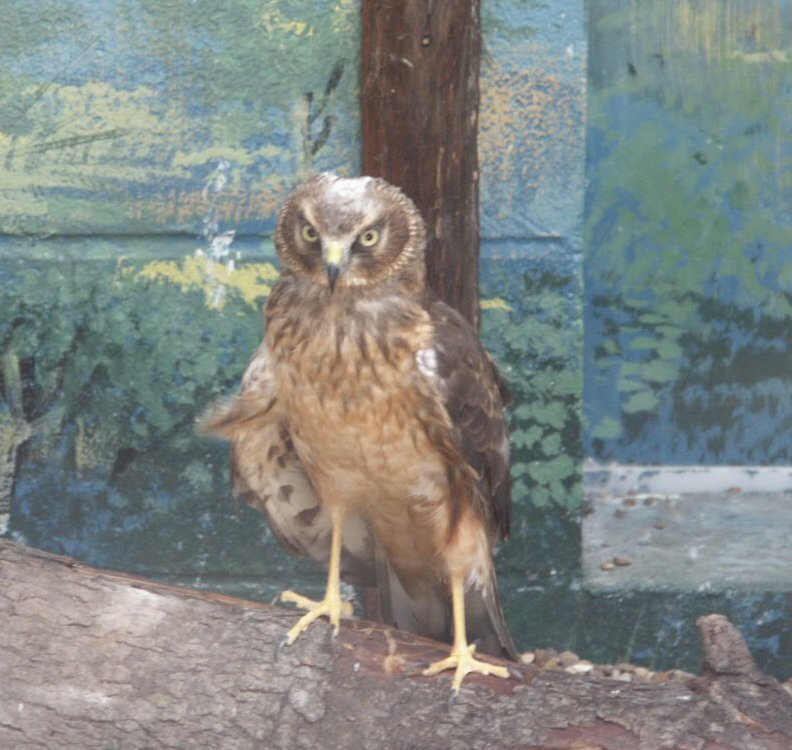 Northern Harriers are found throughout North and Central America. Birds of Nova Scotia. Eagles, Hawks, and Falcon. Northern Harrier. John K. Terres. The Audubon Society Encyclopedia of Northern American Birds. ed 1st . 1980. Alfed A. Knopf : New York.